The River Westbourne, like so many London streams over the past few hundred years, has been press-ganged by the demands of hygiene into becoming a sewer, and buried for the needs of ever more living space. And yet despite all this, the stream alone seems to have a mysterious, magnetic quality of attracting musicians to its banks. A: Paul Robeson’s house on Branch Hill. B: Flat 78 Cannon Hill, Sir Adrian Boult’s abode from 1966 to 1977. The river rises on West Heath, a spur off Hampstead Heath (and is a scene depicted by John Constable in his Branch Hill Pond painting of 1828). The subterranean Westbourne passes immediately under a house on Branch Hill. American singer Paul Robeson bought the house in 1928 and resided here for several years whilst appearing in the West End. The Westbourne runs south-westward towards Finchley Road. Once over this busy thoroughfare it drops down towards West Hampstead on Cannon Hill. It was here between 1966 and 1977, at Flat 78, that the distinguished British conductor Sir Adrian Boult resided. Boult conducted the first ever performance of Gustav Holst’s The Planets in 1918 and would, in 1930, establish the BBC Symphony Orchestra. In West Hampstead the river was forced even further underground following the arrival of three railway lines and stations between 1857 and 1879. It is difficult here to follow the waterway on the surface but the route does take you past two musical establishments. C: The former recording studios of Decca Records. D: The Railway pub. We don’t like their sound and guitar groups are on their way out. The studios are now rehearsal space for the English National Opera. On the corner of West End Lane and Broadhurst Gardens is The Railway pub. On the first floor was a small jazz and rhythm‘n’blues venue that opened in 1961, then named Klooks Kleek. It was here that many fledgling bands and artists performed, including Rolling Stones, Cream, Jimi Hendrix, John Mayall, Stevie Wonder and Rod Stewart. The venue closed in 1970, but re-emerged later as the Moonlight Club. In April 1980, Joy Division played one of their final gigs at the Moonlight. A month later the singer Ian Curtis had committed suicide. On Delaware Road, the Westbourne runs almost beneath the BBC Maida Vale recording studios. In 1934, this former roller skating rink was converted to accommodate the BBC Symphony Orchestra (founded by the aforementioned Sir Adrian Boult) for both live and recorded events. A series of smaller studios were created that would become famous for recording the Radio 1 John Peel Sessions, and were home to the BBC Radiophonic Workshop, creators of the original Doctor Who theme music. 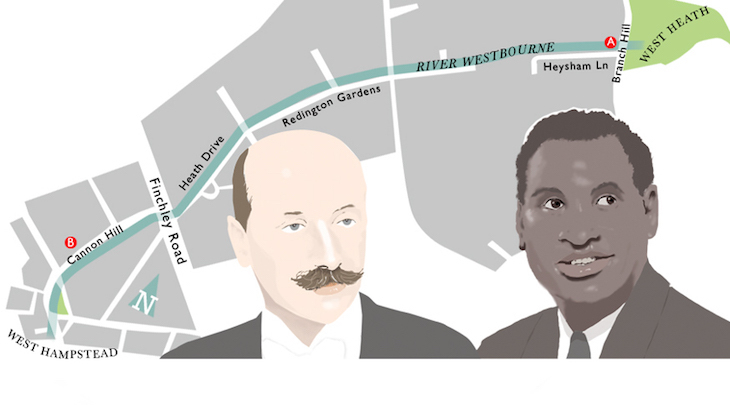 The Westbourne continues on its south-westward flow through Paddington and into Hyde Park. It once used to fill the Serpentine but since becoming a sewer in the mid nineteenth century it has been redirected away from the lake in a pipe. E: 4 Cadogan Lane, home to Judy Garland in 1969. F: Site of the Cadogan Hall. G: Site of the former Ranelagh Pleasure Gardens where a young Mozart gave a musical performance in 1764. In June 1969, the legendary American singer and film actress Judy Garland died at 4 Cadogan Lane. She was 47 years old and had lived at this address for several months. Cadogan Lane at this point sits virtually on top of the Westbourne. The coroners’ report stated that her death was ‘accidental’, though her health had been in decline for some time. Garland made over two dozen films including The Wizard of Oz and the re-make of A Star is Born. Not too much further down stream is Cadogan Hall, just north of Sloane Square. It was originally home to the First Church of Christ Scientist in 1909. This Byzantine looking structure, complete with a bell-like tower, became a music venue and home to the Royal Philharmonic Orchestra in 2004. In the late eighteenth century, the Westbourne was still exposed and it ran as a feature through the Ranelagh Pleasure Gardens, close to the Thames in Chelsea. It was here in June 1764 that an eight year old prodigy, Wolfgang Amadeus Mozart, played the harpsichord at a charity concert. Incidentally, when Paul Robeson lived at Branch Hill he was performing in Show Boat. In the role of the character Joe, was Robeson really singing about the Mississippi in the song Ol’ Man River? Regardless of its entombed subterranean existence, the musical attraction of the River Westbourne, still seems to exist. David Fathers is author/illustrator of The London Thames Path (Frances Lincoln), and can be followed @TheTilbury.